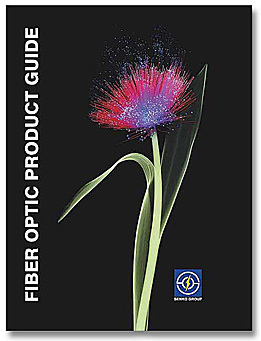 For Senko Fiber Optics, we designed a catalog of fiber optic components. Only the cover appears below, although we did design the entire catalog. We engaged with the fact that the products themselves come in bright and varied colors, so the entire theme of the design was based upon the notion of fiber optics / light / spectrum, and we color-coded the catalog section tabs with rainbow colors. The cover is an unexpected, and therefore memorable combination of fiber optics and nature. For a very “technical” catalog, this piece certainly has strong visual appeal. The 20-page, full color printed catalog features a flyout page inside the front cover, and a custom die-cut pocket for literature set into the back cover.